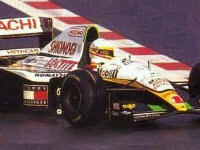 All Monsieur Adams did in his two races for Lotus in 1994 was proving he was way out of his depth. Which means - if we want to be picky - that a British F2 title doesn't mean anything (see Chaves) and shouldn't qualify for an F1 license. But hey, on which basis did Giovanni 'Mr. Johnny Carwash' Lavaggi ever get to drive an F1 car? No offense, Johnny. Taking it as it is, Adams' performances for Lotus only hastened the downfall of this once great marque, which subsequently disappeared at the end of 1994. During its swansong year Lotus was already reduced to a team which had to accept all sorts of insult, like taking on a pay driver like Adams just to make it to the grid, and of course injury, not only because Adams never showed up with the money but mostly because of Pedro Lamy crashing heavily at a Silverstone test (his monocoque jumping the armco and falling into a spectator tunnel). After that, Alex Zanardi bravely took over after returning from his own horrific crash at Eau Rouge the year before. At the hands of Johnny Herbert Lotus made one final leap up the grid at Monza, where Johnny qualified a superb 4th. But after Herbert was snapped up by Flavio Briatore to race for Ligier and subsequently Benetton, Lotus was left with nowhere to go. Their last drivers were Eric Bernard (another talent unfulfilled) and Mika Salo, who said hello to F1 just as Lotus waved goodbye.